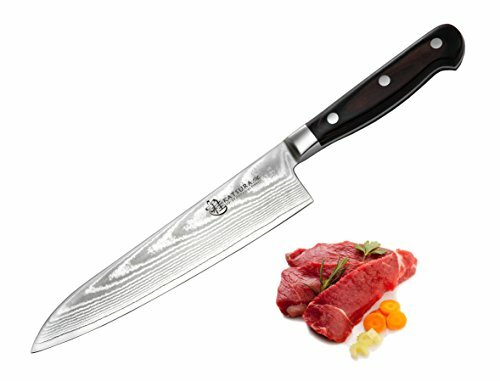 The KATSURA Japanese VG-10 Damascus Knife Series comes with 5 different options, 6.5 inch Nakiri, 8 inch Chef knife, 8 inch Gyuto Chef knife, 5" Small Santoku, 3.5" Paring knife. The blade is crafted by folding 66 layers of Japanese Damascus steel over a Japanese VG-10 steel cutting core with a 62+ Rockwell hardness for a finer and tougher edge that is still easy to sharpen. The PAKKAWOOD handle is perfectly weight balanced and features a full-tang 3-pin design. Designed to suit the cutting techniques used by professional Japanese chefs, this knife series brings culinary mastery to any kitchen. Every KATSURA knife comes inside a handcrafted gift box. USE AND CARE: not for chopping bone; do not use on hard surfaces like granite, tile, or glass cutting boards; wash by hand with gentle dish soap, rinse, and dry with a dishcloth; sharpen with a whetstone at an angle of 15 degrees. Limited lifetime warranty, full satisfaction guaranteed. If you have any questions about this product by KATSURA, contact us by completing and submitting the form below. If you are looking for a specif part number, please include it with your message.